Like an unstoppable horror movie beast, the poncho has crawled back out of its fashion grave. And like a B-movie monster it has now returned meshed together with the corpses of other fashion trends. Behold the "parka cape" which features all the bulk of a parka with none of the warmth and a long tail to get stuck in things. Which then mutates into the poncho-slicker-parka-cape. There's also an evening poncho-cape when you still want to feel really chilly but also have an extremely difficult time picking things up and getting in and out of cars. These girls all need to remember the sage advice of Edna Mode. No capes! Love how bundled up they are in the parka cape poncho thingies, with legwarmers (?) too, and open-toe shoes... well, basically sandals. Um. Yeah. All body parts should be dressed for the same climate, don't you think? Agree with Vicki K on dressing one's entire body appropriately for the weather. At least that first garment looks as though it could be worn on the sidelines by football players keeping warm when not on the field. The rest - worth laughing at, not tryin on. Thank God for Edna! Her presence always refreshes. We all seem to be noting the same thing, parka cape and exposed toes...not a good thing. Yeah, open-toed boots, what is that I don't even! We are mis-reading this whole thing. 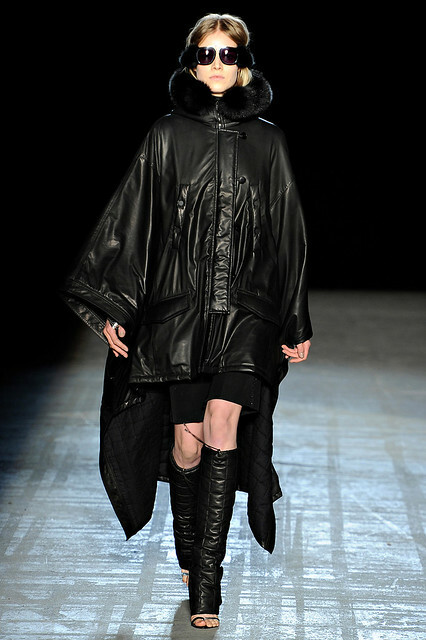 These are not outerwear parka/capes, they are mini dresses from the future, hence the open toed sandal/leg warmers. What appears to be a shiny slicker is in fact a personal solar panel made flexible so it can go with you anywhere, charging your electronics fashionably.The various fabrics and textures are necessary energy storage systems, cleverly disguised as luxury fabrics. Wow. I thought it was bad the first time around...in 1974.